Dave Winfield was one of the greatest all-around athletes to ever play professional baseball. Finding success with several teams, Winfield became a favorite amongst fans of the New York Yankees and Toronto Blue Jays. This is especially true for the Blue Jays as he helped lead them to a World Series win in 1992. 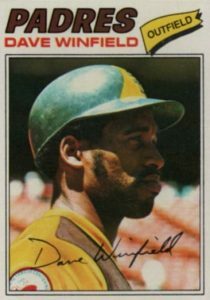 The following list offers some of the best Dave Winfield baseball cards of all-time, including appearances from throughout his storied career. 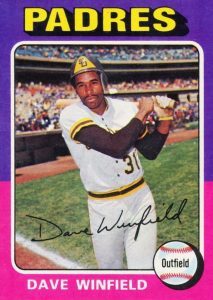 Shop for Professionally Graded Dave Winfield cards on eBay. Straight out of college at the University of Minnesota where he led the Gophers to the Big Ten title in basketball, Winfield was drafted by four different sports leagues, including the NBA (Atlanta Hawks) and NFL (Minnesota Vikings). 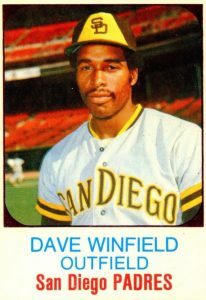 Although he was a pitcher in college, Winfield elected to join the San Diego Padres as an outfielder and went directly to the majors with no time in the minor leagues. Winfield's best season with the Padres was in 1979 when he hit 34 home runs with 118 RBIs. He also batted .308 and added the first of seven Gold Gloves he would earn during his career. When he became a free agent after the 1980 season, Winfield was the most sought-after player available and eventually signed with the New York Yankees for the largest contract ever at that time. It was the details of this contract that would ultimately lead to difficulties with Yankees owner George Steinbrenner. Despite having team problems, Winfield continued to produce at an amazing clip. His best season with the Yankees came in 1982 when he smacked 37 home runs and drove in 106 RBIs. Despite this production, success in the postseason eluded him and he was given the nickname "Mr. May" based on his tendency to have an outstanding regular season followed by his struggles in the playoffs. 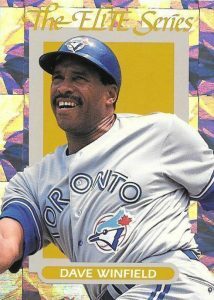 After being traded to the Angels, Winfield found renewed success, winning the 1990 MLB Comeback Player of the Year Award and, two seasons later, he was the key for the Toronto Blue Jays winning their first World Series. In 2001, he was elected to the Hall of Fame on his first ballot and became the first player enshrined as a member of the San Diego Padres. In addition to the cards noted below, an early Winfield card that is difficult to locate is a combination of the Padres season schedule and a trading card that was issued for the 1977 season. The cards were printed in a white and brown color reminiscent of the Padres jersey at the time and the backs list the special events the team was going to hold during the season. Winfield also makes yearly appearances (except in their 1979 set) in the Kellogg's 3-D sets from 1977 through 1983, which was the last year that they issued their famous cereal cards. More recently, Winfield has been a signer for Panini and was featured in 2016 Donruss as well as 2015 National Treasures. With a career spanning 22 seasons, there are many Dave Winfield baseball cards out there. In formulating this list, card value is the main determining factor for inclusion along with graphic design and the overall collecting interest. 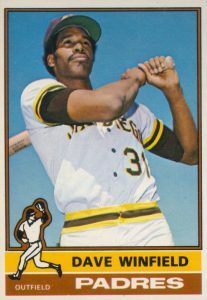 My personal favorite card from Winfield's days with the Padres is his appearance in the 1978 Topps set. With a big bat on his shoulder and razor-sharp sideburns on his jaw, he certainly gives off the look of being one tough customer. As the back of the card tells us, Winfield was developing into one of the best power hitters in the National League after belting 25 home runs and 92 RBIs and making his first All-Star team. 1993 Donruss Elite picked up right where the previous year's set finished in terms of checklist numbering. Again, the insert set featured the best players in baseball, with Winfield among them this time. Along with some great-looking silver foil along the border, each player was limited to 10,000 copies, making it one of the most valuable insert sets of the era. In addition, there was also an Elite Supers set that was similar in design but larger in size (3 1/2" x 5") and made exclusively for Walmart. 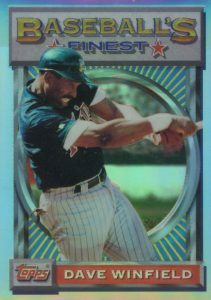 Outside of highly-graded copies of Winfield's rookie card (keep an eye out later down the list), the Refractor version of his 1993 Topps Finest card is probably his most valuable card. Each of the base cards in the 1993 Finest set received the shiny Refractor treatment and collectors could find one in every nine packs (or two per box). It is believed that each parallel has a print run of about 250 refractor copies available. Of the 660 cards that make up 1977 Topps, 55 of them were also featured in one of the few oddball sets that Topps made in the late 1970s. In total, Topps issued 73 cloth stickers (55 player cards and 18 puzzle pieces) that could be peeled off of their paper backing and stuck just about anywhere. As you can tell from Winfield's sticker (on the right below), it featured a reproduction of his main base card and you can see the subtle difference in the texture of the cards from the examples shown. 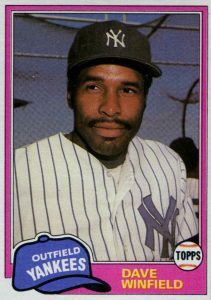 Winfield would reach a new level of stardom when he signed as a free agent with the New York Yankees following the 1980 season. The Yankees made him the highest paid player in the history of baseball to that point and Topps honored the signing by including him in 1981 Topps Traded. The '81 Traded set was the first that Topps would sell as independent 132-card releases and it would be a model they would use for many years into the future. The 1976 Topps Dave Winfield card includes one of the most famous images from his cardboard collection. He is framed perfectly as he appears to watch a baseball sail far, far away with the blue sky behind him. Starting the next season, Winfield would make his first MLB All-Star Game appearance and he would then go on to participate in the next 11 Midsummer Classics. While there are certified autographs featuring Winfield with his other teams (look to 2001 Topps Archives and 2005 Upper Deck Hall of Fame for Padres autographs and 2014 Leaf Memories for Angels autographs), most of his signature cards showcase him as a Yankee during the peak of his career. The 2001 Fleer Greats of the Game sets has a simplistic, clean, and mostly white design that complements the signature and player's photograph very well. Winfield was included in the first Hostess set from 1975 and each dessert package had a three-card panel that collectors could cut themselves. Complete panels are worth significantly more, especially when Hall of Fame members are included. However, Winfield's panel includes Rangers' outfielder Tom Grieve and Expos' catcher Barry Foote, so the overall premium is minimal for intact panels. For the second year in a row, the 1975 Topps set was released all at one time instead of in smaller individual series that made collecting some high-numbered cards very difficult. Even so, collectors have found that the first 132 cards do seem to have a lower print run than the rest of the set. While this includes Winfield's card, his second-year issue is still a great alternative to his pricey rookie card for collectors on a limited budget. There is a mini version of the 1975 card to track down as well. 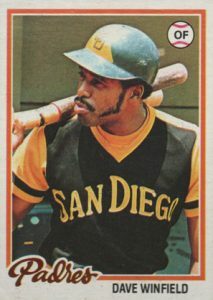 Most of the San Diego Padres cards included in 1974 Topps are famous for being mislabeled as being from Washington as it was thought the team would relocate there from California. 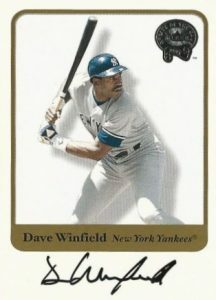 In total, 15 Padres cards feature the error, however, it didn't appear on every Padres card as Winfield's rookie only features the San Diego label. 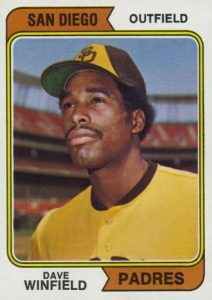 Given that the Dave Winfield rookie card is both the top rookie and overall most valuable card in the set, that limited error would have sent his prices through the roof. Even so, Winfield's most popular card on auction sites can top $700 for mint/near-mint graded copies, with perfect copies reaching many times that amount. Here are a couple great Winfield cards that are a bit less mainstream. 1992 Donruss Update #U-18. Very tough to find because the 22-card 1992 Donruss Update set was only available in 4-card packs in specially marked 1992 Donruss factory sets (in the red box). 1993 Rainbow Foods Dave Winfield #3. A pack-issued 10-card set dedicated entirely to Winfield. This card features him in a great shot coming up for a dunk in his Minnesota basketball uniform, full-blown afro on display.